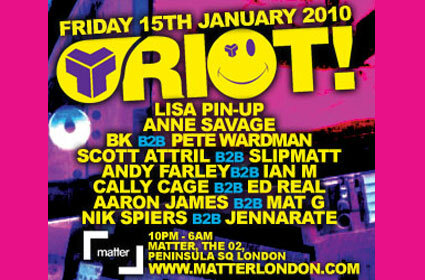 Taking place on 15 January Riot are pleased to announce their first bash of 2010 at Matter in London. For the early bird bargain price of �5 you can join Lisa Pin-UP, Anne Savage, BK & Pete Wardman, Andy Farley & Ian M, and Cally Gage & Ed Real plus many others for Riot Classics. Want an idea of how it works? Check out the video below. Guaranteed to dismal your winter gloom and those January blues.